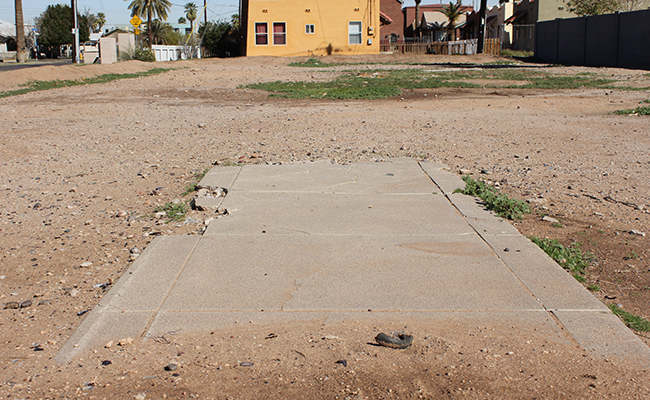 It’s no news to anyone who lives in downtown Phoenix that there are a ton of vacant lots. I am deeply familiar with all of the ones in my Garfield neighborhood. I have photographed them, walked across them and located the remaining debris of homes on them. 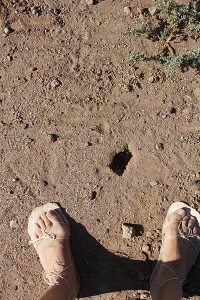 They are a very real part of the structure here and are more than just undeveloped areas of desert. They are built-upon, once-used, stripped clean, recovered with gravel and continuously trimmed and maintained pieces of land. When talking about these bits of patchwork that stretch throughout the city, the tendency is to talk about how these areas can be “developed.” We want someone to “do something” with this space, to fill it, or to make practical business use of it. We might think “store,” or “community garden.” Most developers might already have their eye on it as a place with increasing or decreasing property value that can be turned over for a profit and don’t care what it becomes. More often what I tend to see is free, open space—a fact of the landscape that we regularly interact with on many different levels. I see a platform situated tightly within a community that could make relevant, temporary use of it. Why all this clamoring for indoor, stifling “art” space when we have a wide, vast outdoor venue that is just waiting to be drawn back into the city? Some organizations and individuals have already begun to do this. Roosevelt Row CDC’s A.R.T.S. 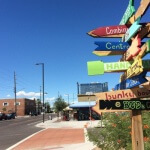 program managed to cultivate an entire field of sunflowers; INFLUX and the City of Phoenix are planning and realizing numerous arts projects on vacant spaces and even Mayor Greg Stanton has gotten involved by utilizing the space adjacent to Steele Indian School park for education, community farming and arts projects. “The Lot: What Should Go Here” poses the question to the community to think about what they’d want next to monOrchid. 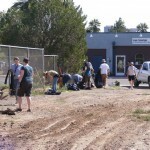 These people and organizations see the availability of this land as an opportunity to beautify our spaces and utilize them for the community’s creations. 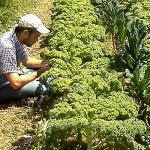 These spaces also hold the potential for different types of work. Rather than putting the spaces through the same process of application, review and execution, individuals have the opportunity at any moment to interact meaningfully with this part of the landscape. An impromptu performance, a shortcut walking from one area to another, a place to fly a kite, an area of soft ground to run on (it’s more acceptable to run around a track? 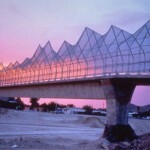 )—these allow us to see the land as less “vacant” as it is continuous. While some areas may be fenced off and monitored, many others are available and have been for some time. What’s to stop someone from launching an impromptu, temporary and litter-less artwork? What would prevent us from inviting people to converge on a space for one hour to be part of a new performance, action, or participatory piece? New York-based 596 Acres has managed to organize a massive project that identifies all the vacant spaces in the city along with a path to activating them. 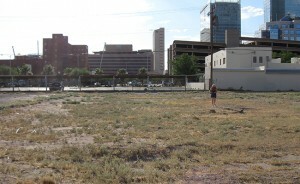 While the calls for proposals from places like INFLUX or the City of Phoenix ask us to consider a space, we also have the power within us to determine where to enact a project, with or without an organization’s approval. By regularly being present in these spaces, we can address them as something other than an off-limits area that should be looked at or treated differently. 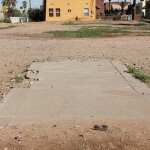 We create, through them, the same as what we have done with the once unpopulated sidewalks and streets of downtown Phoenix. By being physically present, we transform the space.